In this chapter, on the basis of the three-dimensional (3D) dynamic theory of magneto-thermo-elasticity and geological and geophysical input data, the theory of magnetic location of a possible earthquake epicenter area (MLPEEA) has been formulated for the first time and compared (satisfactorily) with the results of electromagnetic (EM) measurements in seismically active regions, published by other authors. MLPEEA is understood here as an area with measurable repeated emissions of a hertz-range EM field caused by relatively weak (maybe regarded as precursory) seismic excitations. Because of the different (mechanical and EM) natures of the physical fields involved, the mathematical types of the differential operators included in the seismo-EM interaction model are different as well (hyperbolic and parabolic), and the resulting model is not of a well-investigated type. In our previous works, we mathematically investigated the correctness of the model for the continuous and discretized variables, and we have applied these results here for construction of the model of the magnetic location mentioned. Practical recommendations for earthquake monitoring are given with application of the developed theory. 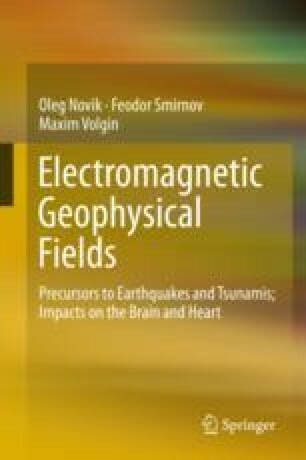 To demonstrate the stability of the effect of the location in regard to the inevitable uncertainty of the geological input data, we carried out simulations of the magnetic location with different reasonable (from the point of view of geophysics and petrophysics) values of the input parameters. In the course of these computations we observed imprinting of the seismic wave on the EM wave, and we describe this phenomenon in the last part of the chapter.